While the election of Donald Trump was a political event, it was also an event that has impact on small businesses and this is a business conversation. As a CEO or hiring manager, how does your small business conduct hiring with Trump as President? If small businesses find themselves needing to add critical talent during the Trump Administration, they will need to give consideration to the current economic factors of the supply and demand of talent as well as the implementation a best practice retention – recruiting process. During the first week of the Trump Administration in office, meetings were held with US automative manufactures and manufacturers in other U.S. sectors. During the same first week of the Trump Administration, the DOW closed above 20,000 for the first time ever. This news alone does not significantly move the U.S. jobs needle. However, it may be the start of a significant economic shift within the U.S. and it may be the start of business growth momentum. The momentum of a rising tide raises all ships. If your small business is facing the momentum for growth, what you are doing about it? Many American business sectors have been shrinking their workforces during the past years. A 2000 report from The Bureau of Labor Statistics says that manufacturing jobs have declined from about 17 million to about 12 million in 2016. In my experience, recent company downsizing focused more on the higher paid, more senior worker and ideally the more expensive worker. As the fifty plus year old worker was unable to find new employment, many settled for an early retirement and are now out of the workforce. 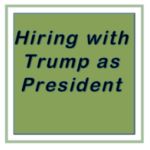 The same highly experienced worker who departed from the workforce prematurely, could be a leader or manager today and positioned to participate in hiring with Trump as President. With trends suggesting a demand for experienced workers and the data suggesting that there may be a limited supply, we could be headed for the perfect storm in a war for critical talent. When companies need to hire with Trump as President, where will growing small businesses go to find critical, senior level talent and how will they do it? – Some companies will be able to promote their mid level managers from within to become their senior level leaders. – Some companies will hire back senior level workers who had previously been part of w workforce reduction. Both of the above options are more of a band-aid then a scalable solution. With the demand likely to outstrip the supply for senior level talent, your small business may become a target for your competitors to seek your talent while other business will become targets for you to identify and attract qualified employees. Hiring with Trump as President will require that small businesses need to pay attention to retaining top talent while also focusing on attracting additional senior level people. – Today’s hiring processes are mostly outdated or broken. – The answer is to define and implement an up-to-date Best Practice Retention and Recruiting Hiring Process. – Develop a reward program that incentivizes good managers and senior level employees to achieve the desired goals of the company. Simply paying employees when the company makes money is not a structured performance based reward program. Paying an arbitrary bonus in January following 12 months of an employee’s dedicated focus is wasted money without the development of pre-defined structured goals and specific rewards. Neither of the above models will retain your top talent. Retention requires investing in the implementation of a formal performance based program that will reward and retain top producers. Click here for an example of a Performance Based Plan. – Audit and evaluate your current hiring efforts for areas that require improvement. Please see Boxwood Recruiting Audit column. – Determine the critical challenges your business is facing and define the business challenge that you need a senior level talent to solve when hired. – Launch a hiring campaign for the purpose of solving your company’s business challenge. Worth noting: Best Practice Hiring should not be a casual event. It is a highly prioritized dedicated effort. – Best Practice Hiring processes need to be interactive and thorough. Hiring short cuts can lead to short time hires. – Best Practice Hiring acknowledges that the marketplace is changing. The ways a business once hired talent may no longer work. In summary, the Trump Administration is driving change from a political perspective and also from a business perspective. Success for a small business today requires nimbleness and agility. What is your small business doing to grow while hiring with Trump as President?